Need help persuading your boss about the importance of content marketing? Don't worry, we have all the points you need right in this blog. So you’ve bought into content marketing. Great! But your boss hasn’t had the time to do the necessary research or they’re feeling skeptical. Here’s your chance to become a marketing hero. You can be the one who spearheads your company’s content marketing initiative and paves the way to getting better leads and higher sales. If you need help convincing upper management, here are a few ways to pitch content marketing to your boss. Your boss knows the importance of brand awareness. As a web marketer, it’s your job to increase the number of eyes that are on your site. How else are you going to grow your traffic significantly unless you begin creating assets that live on your site? These “marketing assets” consist of blogs, whitepapers, case studies, infographics, etc. The point is: more content — in whichever medium you choose — means more ways you can be found. A good exercise would be to gauge what your boss would like to appear when people Google search your company. Then ask if that’s the only query for which he/she wants your company to show up. If not, ask how many other phrases they would like. Wouldn’t they like to come up when users search for questions your potential customers might have? How many questions have been posed to the company? Dozens? Hundreds? Thousands? That’s how many blog posts, whitepapers, case studies, etc. you will need. This is a perfect segue into our next key point: Content marketing allows you to answer the questions that your customers are asking. If you have a physical store and someone comes up to you asking questions about your product, do you answer their questions or not? YES — it’s simply good customer service! This is essentially what content marketing does. It allows you to answer questions for your potential customers before they buy (which helps out your Sales Team as well). If your company isn’t answering questions online, show your boss the competitors who are. Remember that this is also a great opportunity to build trust with your audience and establish yourself as a resource that they can come to with their questions. Content marketing doesn’t limit your content to your own site. We encourage you to go out there and find where your customers are frequenting. Answer questions on forums or social networking sites. Your potential customers are having conversations outside of your website so it’s important that you realize the potential to listen to and engage with them! 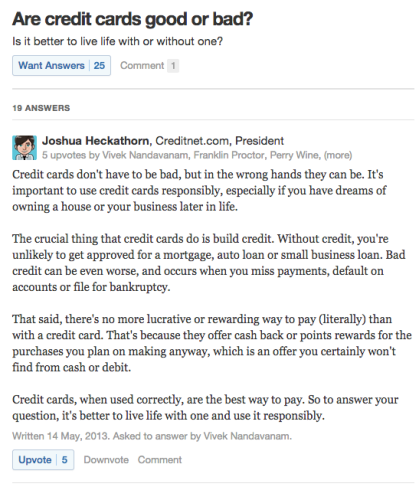 A good rule of thumb when posting on other sites, such as Quora or Reddit, is to offer real answers. Don’t advertise your product (that’s what paid ads are for); instead, you will want to engage and answer questions truthfully. Content that you create can live under “gated” landing pages. Typically this is reserved for high quality content that benefits your audience. If you offer value with your content, visitors will have no problem signing up for webinars, eBooks, case studies, and anything else you promote. This provides valuable insight as you can begin to segment users based on the content that interests them, thus allowing you to continue the conversation via email where you can nurture those leads into customers. There are plenty of content marketing tools out there at your disposal. Our personal favorite, HubSpot, allows you to manage all aspects of content marketing in one place. Better yet, tools such as HubSpot allow you to personalize content to tailor messages to your audience AND show you in detail how your content converts. It’s never been easier to adopt a content marketing strategy and let your online marketing assets work to generate leads for you 24/7. Once your boss is on board, you can begin working on creating a killer content strategy and use a productive brainstorm to develop these strategies with your team. Content marketing is starting to become mainstream and major businesses are starting to adopt their own content strategies. Don’t let your competitors become industry thought leaders while you remain stagnant. Have any other questions on content marketing? Don’t hesitate to reach out and contact us today!